Today we're announcing the return for 2018 of Prolific North Live, the leading media, marketing and creative industries expo outside of London. The event will take place on Wednesday February 28th and Thursday March 1st 2018 at Event City in Trafford Park, Manchester. It will be the third running of the event, with the number of delegates leaping by 70% last year to 3,800 - and we're anticipating even more next year for what will be a bigger and even better event. Here's why speakers, attendees and exhibitors thought Prolific North Live 2017 was such a "vitally important event". We're thrilled to reveal that Channel 4, Steamhaus and The Landing are all back on board as event partners for 2018. 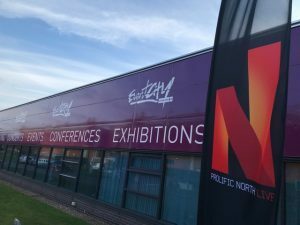 Over 3,800 people, 130+ exhibitors, 120+ speaker and panel sessions made Prolific North Live 2017 a massive success - see the full list of testimonials from last year's event. Prolific North Live '18 will welcome more exhibitors, keynotes, talks, workshops and other sessions - and an even better experience for attendees.